Anne's custom made metal art gate. Oz Metal Art is a family owned and operated metal art studio based in the South Gippsland region of Australia. We specialise in the design and manufacture of Australian weathervanes, personalised signs and many other types of decorative metal artwork. 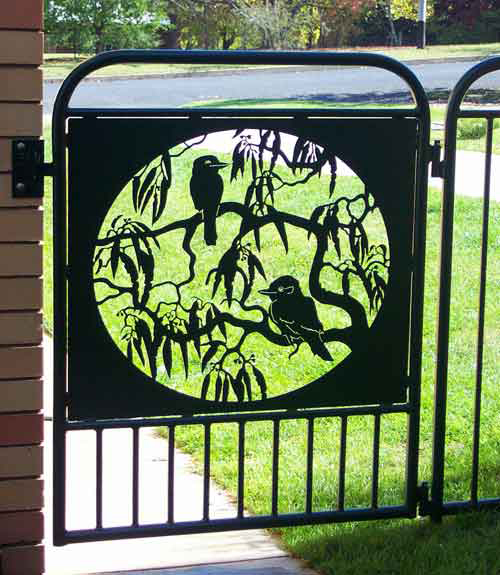 Murray & Mary have been designing and making metal art for their customers for over 15 years and originally started producing steel art as Artisan Steel in Tumbarumba NSW. All of our metal art is now made from stainless steel to last for a lifetime and beyond. Based on our many years of experience we choose to no longer make any metal art work in mild steel. It is almost impossible to ensure that the coating will not degrade, (rust develops underneath the paint ~ all powder coat is permeable and will fail on mild steel over time especially at the sharp cut edges). We can easily add a beautiful faux rust effect for people who love the rustic look with the added benefit of the excellent durability offered by stainless that mild steel cannot come close to matching. Corten steel which is popular in many "natural rust" works continues to oxidise, will stain any surfaces it contacts and has a limited life especially in proximity to the coast. Please look at our metal art gallery for an idea of some of the custom products we have made for a few of our clients.